In their 1976 paper “VMIN — An Optimal Variable-Space Page Replacement Algorithm”, Prieve and Fabry outline a policy to minimize the fault rate of a program at any given amount of average memory usage (averaged over memory accesses, not real time). VMIN defines the cost of running a program as C = nFR + nMU, where n is the number of memory accesses, F is the page fault rate (faults per access), R is the cost per fault, M is the average number of pages in memory at a memory access, and U is the cost of keeping a page in memory for the time between two memory accesses. VMIN minimizes the total cost of running the program by minimizing the contribution of each item: Between accesses to the same page, t memory accesses apart, VMIN keeps the page in memory if the cost to do so (Ut) is less than the cost of missing that page on the second access (R). In other words, at each time, the cache contains every previously used item whose next use is less than τ = R accesses in the future. Since there is only one memory access per time step, it follows U that the number of items in cache will never exceed τ. Since this policy minimizes C, it holds that for whatever value of M results, F is minimized. M can be tuned by changing the value of τ.
Denning’s working set policy (WS) is similar. The working set W (t, τ ), at memory access t, is the set of pages touched in the last τ memory accesses. At each access, the cache contains every item whose last use is less than τ accesses in the past. As in the VMIN policy, the cache size can never exceed τ. WS uses past information in the same way that VMIN uses future information. As with VMIN, the average memory usage varies when τ does. Compared with DRAM, phase change memory (PCM) can provides higher capacity, persistence, and significantly lower read and storage energy (all at the cost of higher read latency and lower write endurance). In order to take advantage of both technologies, several heterogeneous memory architectures, which incorporate both DRAM and PCM, have been proposed. One such proposal places the memories side-by-side in the memory hierarchy, and assigns each page to one of the memories. I propose that the VMIN algorithm described above can be modified to minimize total access latency for a given pair of average (DRAM, PCM) memory usage. Define the cost of running a program as C = nFRF + nHDRAMRH,DRAM + nHPCMRH,PCM + nMDRAMUDRAM + nMPCMUPCM, where we are now counting the cost of a hit to each DRAM and PCM, since the hit latencies differ. 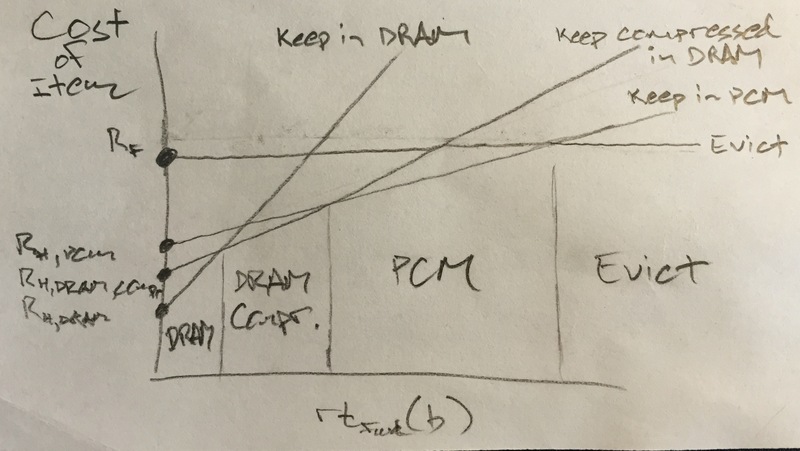 If at each access we have the choice to store the datum in DRAM, PCM, or neither, until the next access to the same datum, the cost of each access b is rtfwd(b) * UDRAM + RH,DRAM if kept in DRAM until its next access, rtfwd(b) * UPCM + RH,PCM if kept in PCM until its next access, and RF if it is not kept in memory. At each access, the memory controller should make the decision with the minimal cost. Since the only free parameters are UDRAM and UPCM, this is equivalent to having two separate values of τ, τDRAM and τPCM in the original VMIN policy. The WS policy can be adapted by simply choosing a WS parameter for each DRAM and PCM. If DRAM compression is an option, we can quantify the cost of storing an item in compressed form as rtfwd(b) * UDRAM \ [compression_ratio] + RH,DRAM_compressed. I really like the joint description of VMIN and WS and thought it is concise and clear. The extension has 12 factors, which is not easy to digest. Are they just two sets of VMIN factors? The line drawing of rt(b) is helpful, showing the two decisions these factors help to determine. NVM technology is still evolving. Here is a technical projection of NVM compared to DRAM, from an authoritative but unnamed source: higher latency, lower bandwidth, limited read endurance vs essentially infinite, vastly reduced write endurance vs essentially infinite DRAM, longer write cycle time than read cycle time, higher read energy than DRAM, higher write energy than read energy. One factor mentioned above is endurance. Storing data on NVM is cheaper than on DRAM (in cost and energy) but every write (and to a less extent, every read) is more expensive on NVM than on DRAM. Thanks for the response. In the model, I think it will be fairly simple to distinguish reads vs. writes, and have a cost for each operation on each form of memory (even though cost is normally associated with time, as opposed to endurance/energy/etc.). Implementing this for a heterogeneous WS policy would involve keeping track of two separate working sets for read and for write. Joe is working on NVM for transactional memory. I talked with him on Wednesday, and he claims there is a convincing argument for ignoring write endurance due to good wear-leveling (and many people do ignore it).